Wow! What a Great View! We've heard this comment many times from vacation rental guests and friends visiting our Maui condo. The picture above greets you as you enter and is visible from nearly every room. The walk to the beach is less than 4 minutes. When you turn your attention inside, you find our newly remodeled, two bedroom, two bath "Home Away From Home". Maui's southwest side, home to Wailea Ekahi Village, is sunny and dry, with gentle ocean breezes and numerous fabulous beaches. Ekahi is well-known for its beautifully landscaped grounds, spacious common areas, and its ocean side pool and pavilion. The beach, Keawakapu Beach, is one of Maui's finest. When we're staying at our condo, our days include: swimming; lounging at one of Ekahi's four pools; early morning and sunset beach walks; snorkeling; golfing at courses with some of the best views you'll find; and dining-in or enjoying one of the many convenient Wailea restaurants. But best of all, we relax, and enjoy what is truly paradise. We invite you to come and stay in our comfortably appointed Wailea Maui Condo with views of Ekahi's unique tropical landscape, neighboring islands, and the ocean. We know you'll love our home, and want to return to stay again and again. 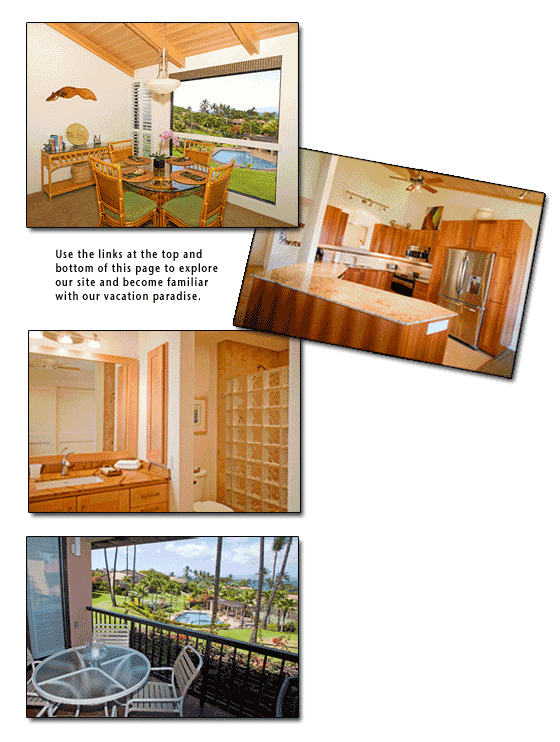 Copyright © 2010-2017 MauiWaileaViewCondo.com All rights reserved. Site developed and maintained by Personalized Computer & Internet Services.